For a maker of farm equipment, Hans Glas GMBH has some very interesting and critical connections to the car and motorcycle industry (see BMW 2002 Touring). This particular connection revolves around their decision in 1950 to enter the motorcycle industry by producing a scooter. It was said that Andreas Glas was inspired by a trip to the Verona International Agricultural Fair in 1949. Prototypes appeared soon after, and in 1951 the first production units went on sale. 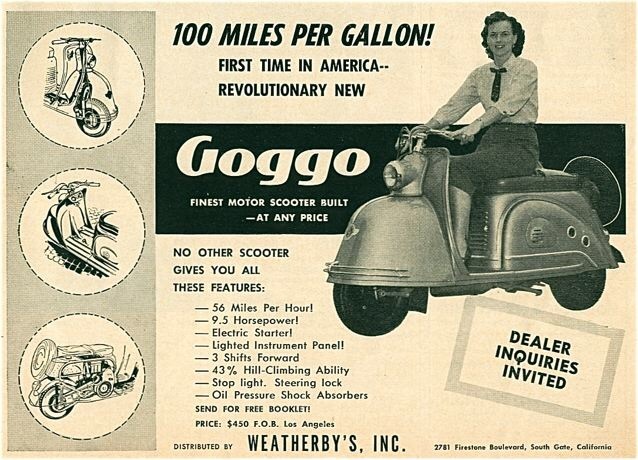 They were branded Goggo, and featured a fully enclosed design similar to Italian scooters of the time. They were offered in 125cc, 150cc, and 200cc displacements, with associated increase in power and top speed. All featured telescoping font forks, spare wheel, 12 liter tanks, and 12 volt electrical systems. The 200cc versions offered 4 speed transmissions versus the 3 speed on the lower models. There was a 200 Deluxe model which offered a slightly longer wheelbase, and load capacity. A sidecar version was added soon after, and then in 1953, a 3 wheeled utility model was introduced to tackle industrial needs. The 3 wheeler was available in a variety of configurations. Goggo never made it to the US, but there were attempts as the Ad above indicates, and a few have made their way in over time. Over 46,600 units were sold over the five year period from 1951 to 1956. Glas then ceased producing scooters in order to concentrate on the microcar and delivery vehicle markets with their Goggomobil brand. Glas eventually became part of BMW in 1966.